This project was for a customer in La Jolla, CA, 92037 and they requested that we replace their old Sta-Rite Maxi-Glass pump with a Pentair variable speed pool pump. There were two main reasons for making the change the first being that the old pump was old and running loud along with they were looking for a more energy efficient pump. Seeing that the pool equipment was installed directly across from the back patio door leading to the swimming pool it made any additional noise stand out like a sore thumb. The great benefit of installing a new Pentair IntelliFlo 2 VSt pump is that when running in the low speed, it can almost be silent. 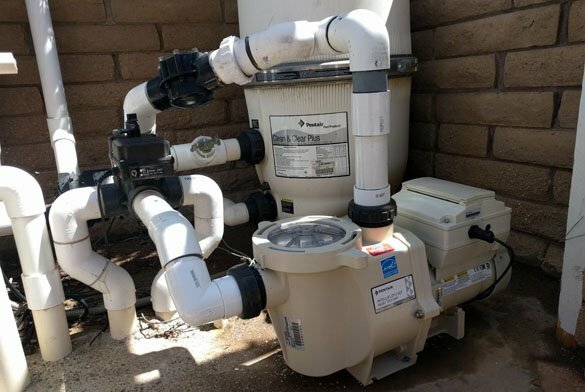 This swimming pool was already set up with complete pool automation that consisted of a Pentair IntelliTouch pool controller so installing the Pentair variable speed pump was a no-brainer. Once we complete the new pump installation we will program all of the specific run times for the pool pump and also set any specific functions the customer may want. This energy efficient pool pump can run with multiple speeds giving you the capability to set just the right speed for the pool or spa. No longer does your pump have to run at full speed to perform a simple task of water turn over. 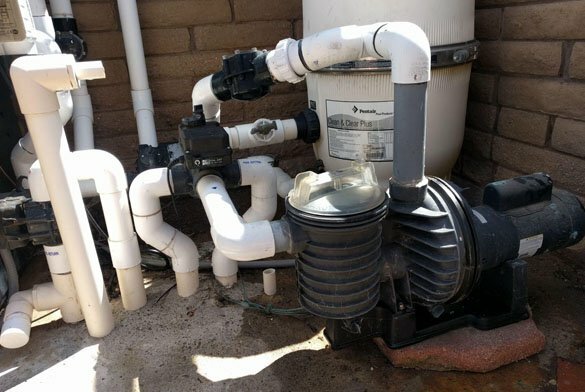 We also install all of our pool pumps with hi-temp unions so that if you ever need a pool pump repair, you will not need to cut the plumbing you simply loosen the unions and the pump slides right out. We installed this new Pentair IntelliFlo2 VST variable speed in La Jolla, CA, 92037 though we also provide this pump installation service throughout San Diego County.